Windows 10 Mobile build 15254.538 (from .530) for all phones currently running the 1709 branch ('Fall Creators Update') is fresh out today, so go grab it now. Similarly, build 15063.1390 (from .1324) is out for all phones running the 1703 branch ('Creators Update'). Rather surprising is an update for the Anniversary Update, even though it's now 'out of support'! The Fall Creators Update ("FCU", 'rs3', i.e. 'Redstone 3', at least in name) is the 'production' branch of Windows 10 Mobile, and these are regular 'Patch Tuesday' fix round-ups for it, with the official list for 15254.538, the '2018-10' update' mainly composed of minor fixes and security patches, at least in terms of mobile relevance. All of which are fully supported officially, with updates until the end of 2019. As usual and as per the graphic above (the rectangles in a shade of red), one other supported Windows 10 Mobile branch is getting an update too, so all those older phones (Lumia 930, 830, 735, 640, etc.) finishing life on the Creators Update (if the user was clued up enough to have been on the Insiders Programme for most of 2017) aren't losing out on core security fixes. 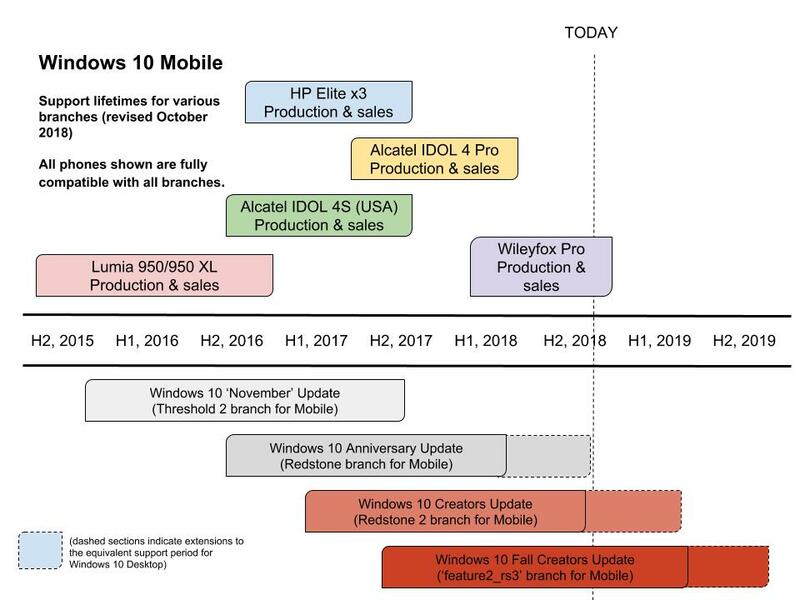 You'll spot from my diagram that we've now reached the end of the update schedule for phones on the Anniversary Update (AU) - meaning that anyone with one of these older phones who stayed on 'production' status will now be 'frozen' in time in terms of security - though build 14393.2551 (from .2485) seems to be rolling out now - so I guess this really is THE last one! However, looking to the future, don't worry too much if your phone still runs AU (Windows 10 branch 1607) and you're not feeling confident enough to go for our hack. Although you'll not get any more OS updates, Windows 10 Mobile is a very small target in the grand scheme of things, so you'll be fine as you are. And you'll still get application updates, of course, possibly for years to come. But the hack is now de rigeur for anyone with one of these older phones who cares about absolute security and the good news is that most geeks who have tried it now have their older phones running the very latest FCU. So give it a try if you're feeling adventurous! Phones on the Creators Update should advance, with this release, to build 15063.1390 (from .1324) As with the Fall Creators Update, you get the core security and component updates. As usual, in today's vulnerability-stricken, malware-strewn and fraudulent times, we should never disregard security fixes and the later the branch and security state, the better. As ever, with all phones, head into Settings/Update & Security/Phone update in order to (try to) get the update immediately. PS. Note the effective (in terms of new builds) termination of the Insiders programme - we've only been dealing with these 'Patch Tuesday' updates since February 2018. Besides the lack of development of new features, Insider builds for Mobile are just not worth bothering with for Microsoft, since the changes from month to month are small enough (and common enough to Desktop) to just be tested internally.